Read my story and why I felt this cookbook could help make it easier for others to lose weight on the 6 Week Body Makeover. When I started this program, I quickly figured out I wanted to find a way to incorporate my family recipes into the program. Who wants to cook one evening meal for your family and a different one for yourself? Not me! Creative Cooking & Recipes Cookbook contains my favorite recipes and Recipe Anatomy explains how I converted those favorite recipes for use with the 6 Week Body Makeover weight loss program. Recipe Anatomy demonstrates how you can learn to convert your own family's favorite recipes for use with the 6 Week Body Makeover. 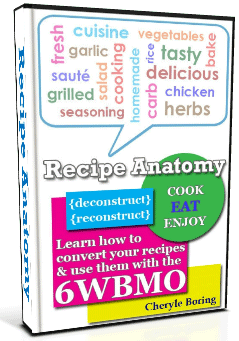 The test recipes in this guide were analyzed for compatibility with the 6WBMO and adapted accordingly. Each recipe comes with a chart that categorizes body-type, meal compatibility, number of portions and serving sizes. While learning how to convert and prepare your own recipes for the 6WBMO, you will also learn how to calculate serving sizes or portions to fit the program. How to calculate recipe portions with confidence! Compatibility: Does it work with the 6WBMO? When you are enabled to prepare appetizing meals that appeal to your taste buds, you are much more likely to stick with your weight loss program. Sticking with your weight loss program spells success for you! You'll see those excess pounds melt away. Get your copy of Recipe Anatomy today. When you order Recipe Anatomy, you're ordering absolutely risk-free! You are fully protected by my 60-day money-back guarantee. I guarantee your satisfaction. If you decide Recipe Anatomy isn't for you, let me know and I will refund your entire purchase price right away. There is no waiting for your guide. Start downloading your copy immediately after purchase. There is no risk to you with my money back guarantee. Order Recipe Anatomy now and start converting your own recipes. Order our exclusive guide for only $7.95. Chicken in Green Sauce Chicken cooked in a homemade green tomatillo sauce. Delicioso! Chicken with Paprika and Potatoes An all-in-one meal. What could be easier? Crispy Potato Slices This recipe satisfies my craving for fried potatoes. I love potatoes! Plus get your free bonus of 30 summer lemonade recipes.